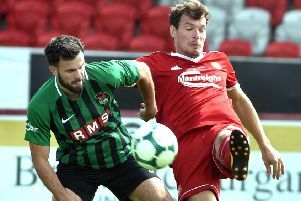 Ryan Latifi’s second-half strike sent County Armagh marching into the Junior Section’s Globe final at the expense of Strikers. The 1-0 win arrived in Coleraine to set up a morning showdown with County Down tomorrow (Friday) at Broughshane from 11 o’clock. “It is great to get into the final and we will certainly be able to renew old acquaintances against County Down,” said County Armagh coach Dean McCullough. “We dominated the first half but went in at 0-0 despite chances. “Jack McIvor had a close-range header then Alberto Balde managed to round the goalkeeper but his shot was cleared off the line. “You get a bit nervous after playing so well but without the reward and maybe we were expecting a sucker-punch in the second half. COUNTY ARMAGH: David Walsh (Linfield), Daniel Gordon (Portadown Youth), Ruairi McDonald (Dungannon Swifts), Jack McIvor (Glenavon), Lee Upton (Portadown Youth), Harry Evans (Portadown Youth), Rioghan Crawford (Lurgan Celtic), Chris Hutchinson (Portadown Youth), Tyler Marsden (Portadown Youth), Ryan Latifi (Portadown Youth), Alberto Balde (Portadown Youth). SUBS (used): Tom Barratt (Portadown Youth), Scott McCann (Loughgall Youth), Patrick Kerr (Armagh City), Ryan Carmichael (Loughgall Youth), Jack Adamson (Portadown Youth).